Price includes Letters up to 15 on the back...in one of our fonts. You can choose more from the drop down menu. This does not include having a Logo digitized. If you have a name or words on back and want to add a Name to the front chest please contact us prior to purchase as that is an add'l charge. 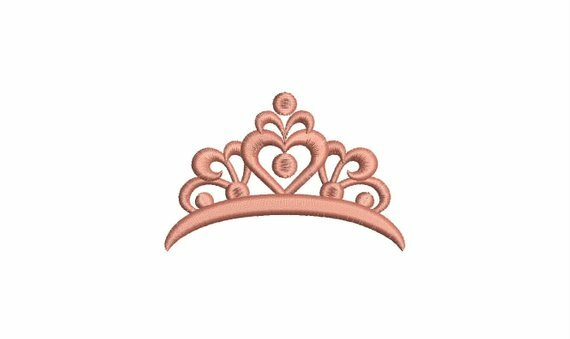 Send us your company Logo in .jpg or .png format for a quote before purchase - (logos have a one time set up digitizing fee and can be used on any future products for just the price of the product and a stitching fee after the first one time digitizing fee.) Quotes take 2-3 business days and setup price depends on the complexity of the design, size needed depending on size of hoodie/garment, and number of thread colors. Logos one time digitizing fee typically range from $35-$225. After that it is the price of the hoodie (discounted from this price including up to 15 letters) plus the stitch fee for the logo. 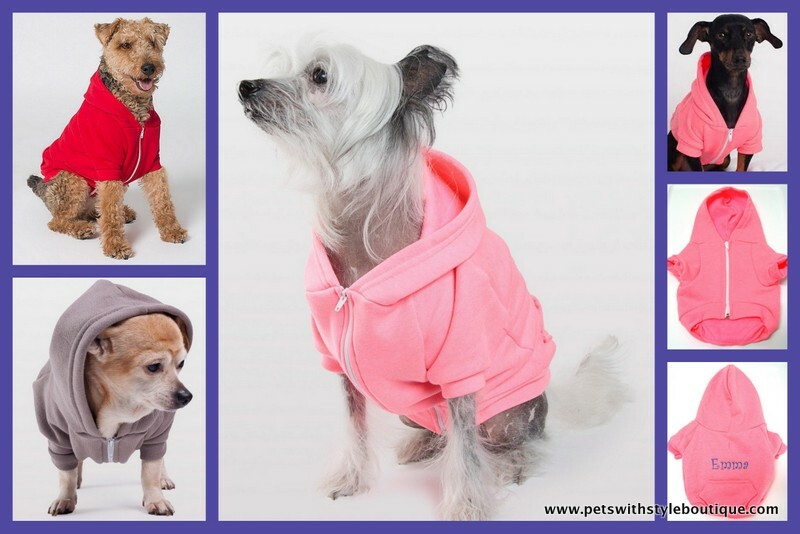 This Hoodie Sweatshirt is truly a customer favorite and also one of ours....great to wear when it's cold outside but also great around the house when the thermostat is turned down...keeps the hair off of furniture as well....our Yorkie (6.5 lbs wears the Small), Emma wears hers all the time in the winter as she has adjusted from FL to CO's weather! 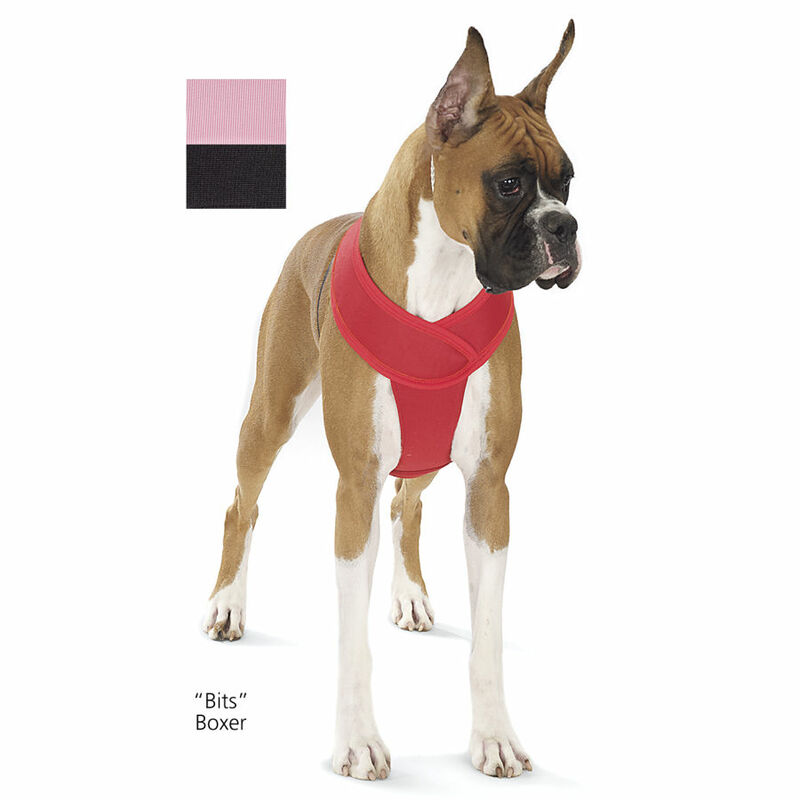 Easy on and off and machine washable. 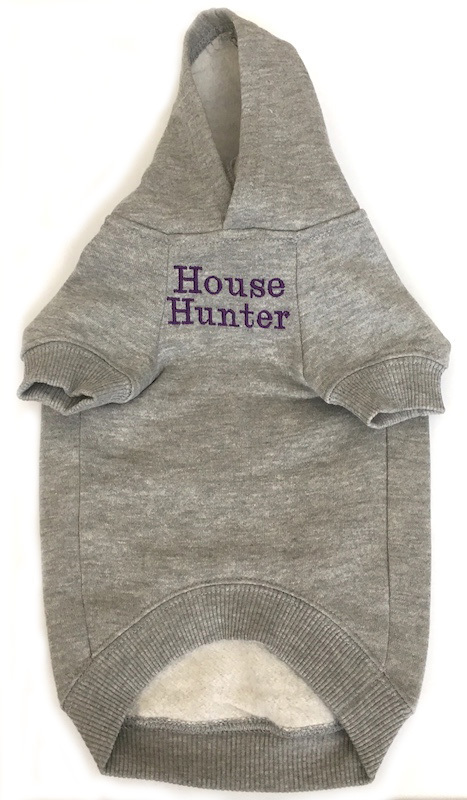 (We try to put the name and/or design to be seen when hoodie is down. Thanks Brittany for the pics of Dahlia! 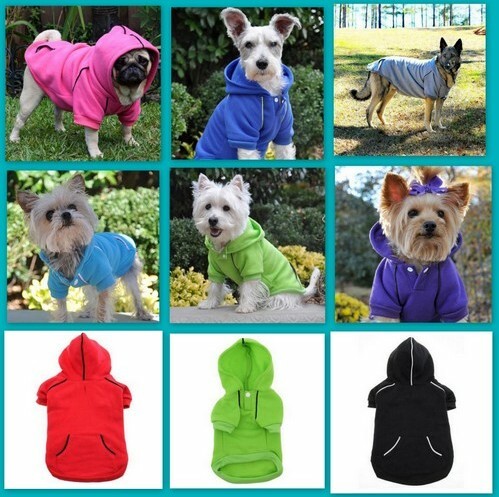 For your convenience I have given the actual measurements of the Hoodie to compare to your dog's measurements..breed sizing or weight is not a substitute for measuring your pet. 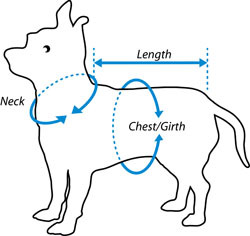 For best fit and to ensure easy movement... your pet's chest measurement should be at least 2" less than the actual chest measurement of the sweatshirt...be sure to take into consideration your pet's hair length as well. There is minimal give in the sweatshirts but not a lot of stretch. 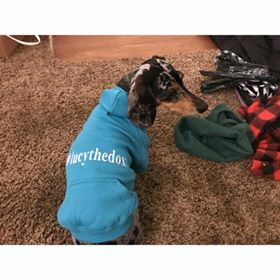 Personalized items cannot be returned or exchanged unless we've made a mistake so please measure your pet carefully and please check the personalized info that you give us carefully. We do not correct spelling or grammar, we stitch it as it is written. We do give a discount on another if you purchase the wrong size or give us incorrect information...please contact us for the discount. Need this quickly? 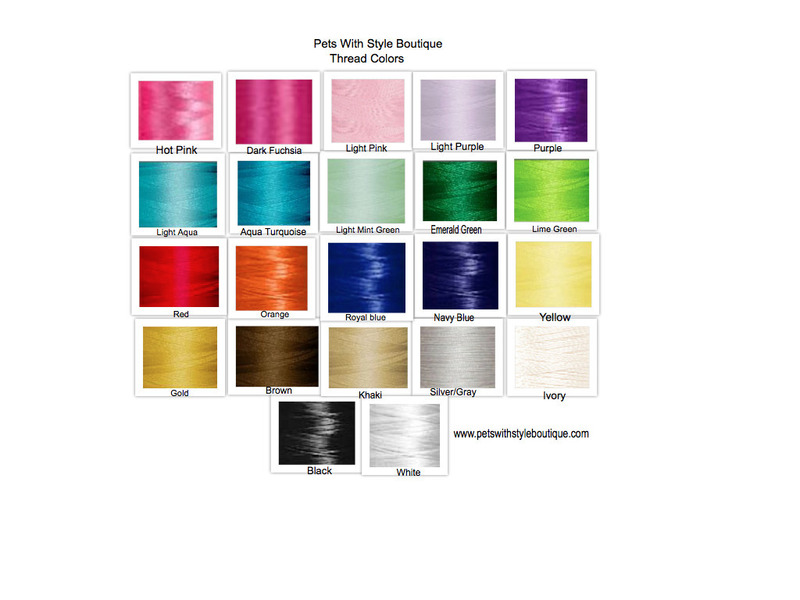 First start by choosing Priority Mail...we also have a Please RUSH my order option for an additional fee, which boosts your embroidery to the front of the line behind any other Rush orders ahead of yours. 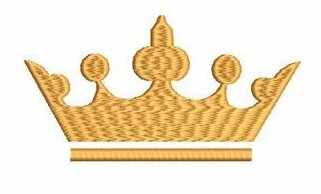 Current custom embroidery times are kept up to date on our Home Page...typically 5-7 business days. XS: Length 8" Neck Opening 12" Chest before any stretching 16"
Small: Length 12" Neck Opening 14" Chest before any stretching 18"
Medium: Length 16" Neck Opening 16" Chest before any stretching 22"
Large: Length 20" Neck Opening 18" Chest before any stretching 26"
XL: Length 24" Neck Opening 25" Chest before any stretching 32"
XXL: Length 30" Neck Opening 28" Chest before any stretching 38"
For best fit and to ensure easy movement... your pet's chest measurement should be at least 2" less than actual chest measurement of the sweatshirt...be sure to take into consideration your pet's hair length as well. There is minimal give in the sweatshirts but not a lot of stretch. 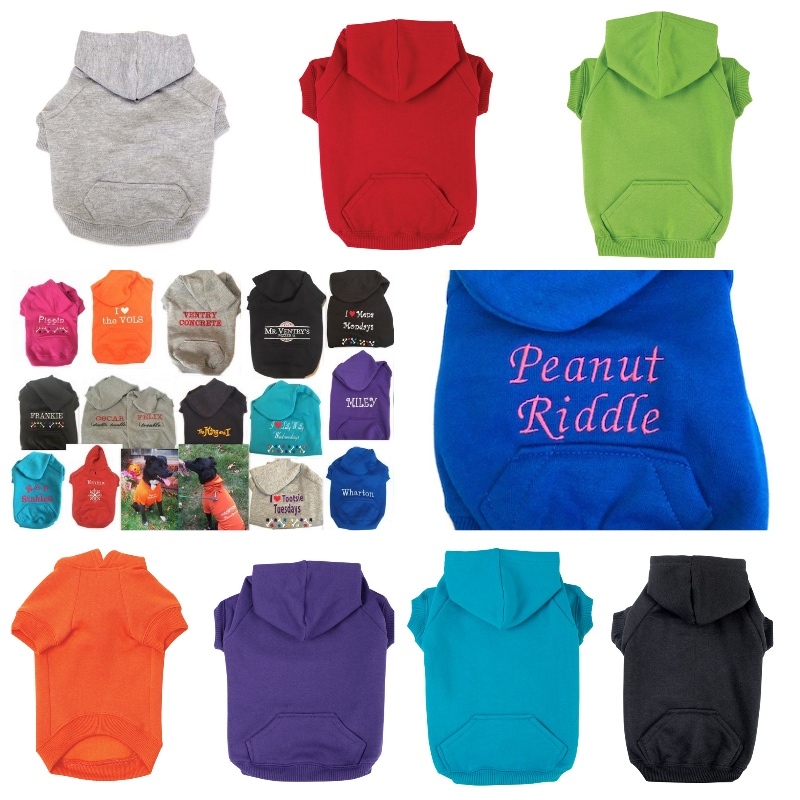 Letter size is determined by the Size of the Hoodie and the Name or Combination of letters and letter style chosen. We make it the most reasonable size based on your choices. Name is typically placed across the upper back. We can also stitch on the pocket if you desire, but it will stitch all the way through the pouch, rendering it at least partially closed, depending on what is stitched on it. 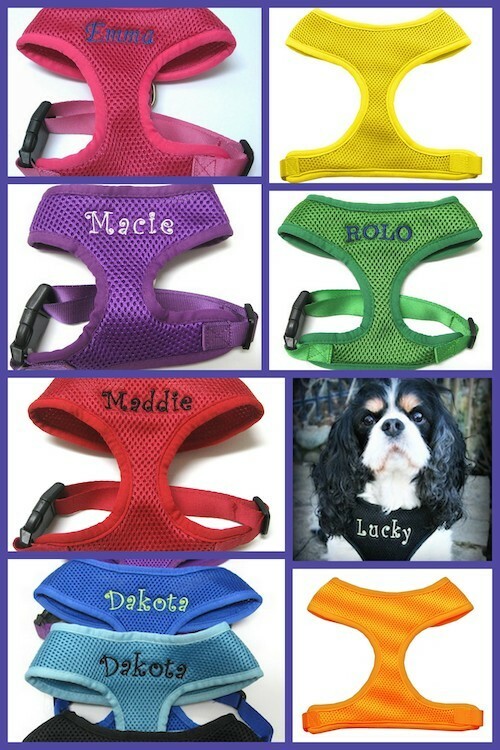 Contact us for a Custom Quote at info@petswithstyleboutique.com or if you have special instructions prior to purchase. 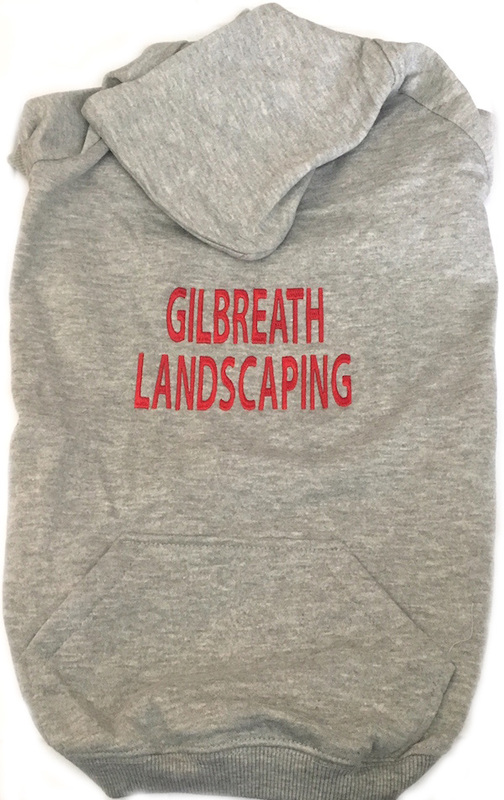 If you want something on both the back and front of the hoodie, please contact us first for a quote. 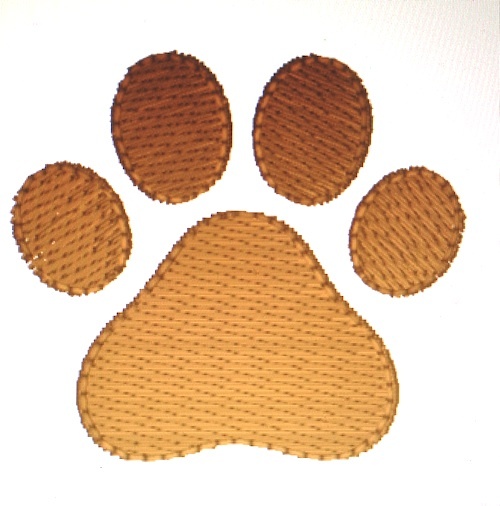 Multicolored Paws and Bones - colors will be chosen based on the color of the sweatshirt chosen, and whether male or female if noted, as we cannot always tell by the name. 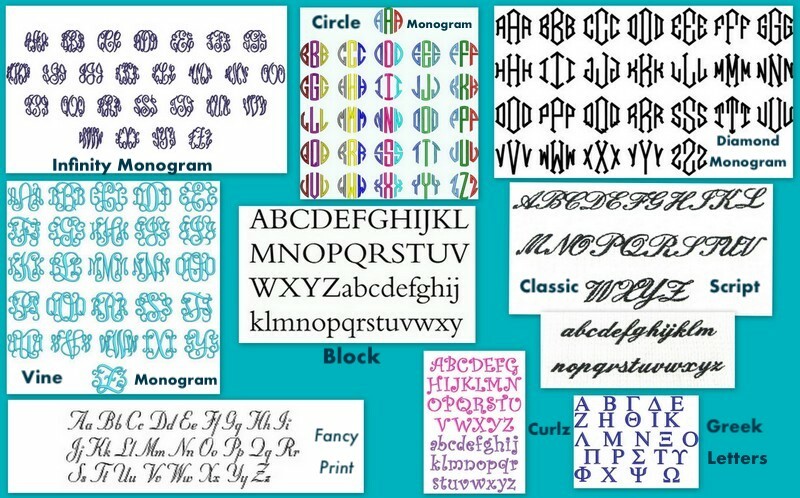 Personalized items cannot be returned or exchanged so please type in your choices carefully especially on the monograms. When choosing multiple words we will use Block lettering unless you have requested a Custom Quote. 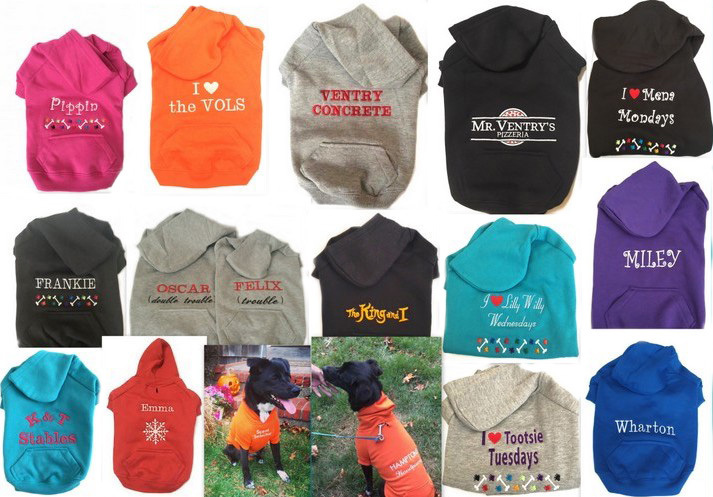 Custom embroidered items cannot be returned or exchanged unless we've made a mistake so please measure your pet carefully and please check the personalized info that you give us carefully. We do not correct spelling or grammar, we stitch it as it is written. XL: Length 24" Neck Opening 26" Chest before any stretching 32"
Please choose the correct number of letters that you are requesting. We automatically can increase the size of lettering on larger sizes when the correct number of letters is chosen. 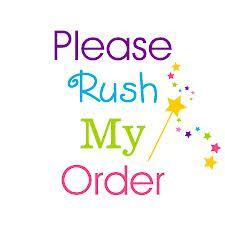 Also if you choose the incorrect amount of letters it will delay your order as we collect the add'l amount. Double check measurements and size as Custom embroidered items are not returnable due to purchasing the wrong size. We do give a discount on another size if you do purchase an incorrect size.